No much deck to sit on! 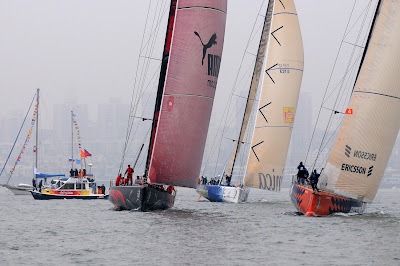 After waiting patiently over the weekend, the fleet managed to complete two races during today’s In Port race in Qingdao. There was just enough wind to race (5 - 7 knots maximum), the teams also had to contend with very shifty winds and local currents. Green Dragon had a fantastic first race taking a confident second place and pushing Ericsson 4 hard for first. But the second race did not go their way, and the Dragon lost ground on the fleet after being caught in a wind hole, and they were forced to play catch up. They pushed hard but were unable to close the gap on PUMA who took third leaving the Dragon with a second and fourth at the end of the day. Overall, Ericsson 4 took the full four points on offer from Telefonica Blue. PUMA and Green Dragon were tied following the two races, but PUMA took third place on the count back having finishing ahead of Green Dragon on the last race. Fourth place overall today means a valuable points 2.5 points on the score board which gives Green Dragon 30 points on the overall scoreboard and extends the gap to six points from Ericsson 3 in fifth. Speaking after racing today Ian Walker commented, “I thought everyone was pretty even. We made one mistake at the bottom of the run and got stuck in now wind. If we have been second in the last race we could have been first overall! But it is nice to be competing with those guys, and I think we are getting a little bit more out of the boat, our mast head zero is a big improvement. Today was all about how you sailed and where you went and what you did. The last thing we wanted was another delay so it was good to the get the sailing in”. Last night saw a gala event to celebrate the first ever Volvo Ocean Race stopover in China. The Shanggri-la hotel hosted the Qingdao stopover prize giving which was attended by 600 people including crews, sponsors and local officials. It was a good night for the crew onboard Green Dragon as they took home the Wallenius Wilhelmsen Logistics Seamanship award after the structural repair work during Leg 4. The crew managed to save the mast after suffering a broken forestay, and affected major structural repairs to the forward bulkhead and still managed to get to Qingdao in one piece! The boats left the dock nice an early at 0700 in order to sail out of the harbour under the right tide. The crews were all ribbed out a little later and they lined up ready for racing to kick off at 1030. In light 7 knot winds and moderate visibility the fleet set off for race one, and there was a clear split off the line. Ericsson 4 and PUMA headed inshore on port tack flying their Code Zero, whilst Telefonica Blue and Green Dragon chose the starboard tack flying jibs. As they headed up to the first gate, the Dragon forced Telefonica Blue to tack early, Ian Walker and his crew then waited for clean air before tacking themselves. The Dragon was holding a good third after an unusually shaky start from Ken Read onboard PUMA. On the first downwind leg Green Dragon, Ericsson 4 and PUMA all flew their big Code Zero’s, with just Telefonica Blue staying with the jib. 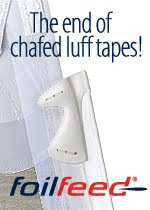 It was a smart move for Green Dragon as they made a late charge with their sail. The gains started to show as they closed the gap on Telefonica Blue and the fight for second place was soon in full swing. 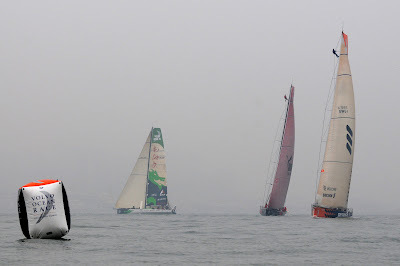 By the bottom mark the Dragon has taken two minutes out of Bouwe Bekking and his crew. From then on it was a case of keeping the pressure on, as they approached the top mark for the final time the Dragon had rolled Telefonica Blue. Now in second place Green Dragon had Torben Grael and his men in their sights. It looked to be a drag race to the finish, but in an aggressive move by Ian Walker tacked early ahead to the right hand side of the course, giving the Dragon the lead. The Dragon lead through the final gate for one last downwind leg to the finish. As they approached the final section of the course they couldn’t hold off Ericsson 4 who rolled over them, but a clearly jubilant crew and skipper were very pleased with second place. The fight for third and fourth carried on behind, Ken Read turned around a bad start to pull back the distance on Telefonica Blue, edging in front to secure third as the Spaniards settled for fourth. The second race of the day was not the sunshine and roses that the Dragon had hoped for. Green Dragon took the pin end of the line, it was a good start for Ian Walker as they headed out to the left hand side of the course in clear air. Ericsson 4 followed suit, whilst PUMA and Telefonica Blue went right. By the time the fleet rounded the top mark, visibility had clearly decreased, and the breeze was now down to 5 knots. 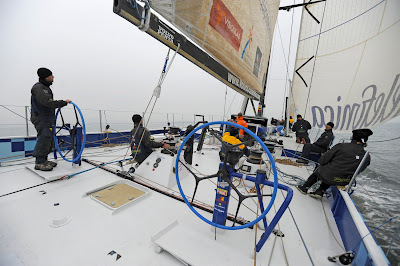 Telefonica Blue led with Ericsson 4 and Green Dragon once again caught in a duel for second place. Green Dragon has a good downwind leg and was ahead of Ericsson 4 at the next gate. As they approach the final mark, Ian Walker and his crew were putting some distance between them and the current race leaders Ericsson. Conditions from this point proved tricky for the Dragon, sailing into no wind and an unfavourable right hand shift. PUMA made a great comeback, rolling over the Dragon in the middle of the course. In doing so PUMA blocked Ericsson 4 almost bringing them to a standstill as they crossed ahead of them. Telefonica Blue held strong and crossed the line to take home first place. The battle for second and third was soon over as PUMA were closed down on the final downwind leg by Ericsson 4. Green Dragon worked hard to make up ground on PUMA, but it was too late and they were forced to settle for what can only be described as a frustrating fourth.